(LtoR): Mark King, Kerri Allen, Pasha Sovourin, Joanne Maki. 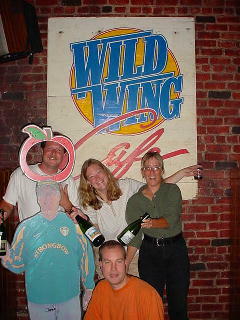 Owen Ogletree (director of Brewtopia Events) gathered together some of his devoted beer loving friends in June of 2002 at Athens' Wild Wing Cafe to sample and comment on several mixed styles of Belgian beers. This beer sampling was done as a blind tasting where no one was aware of the brands that were being served. Beers were informally commented upon and ranked according to American Homebrewers Association (AHA) style guidelines. First, second, third places, and honorable mention were awarded to the beers we felt represented their individual styles in extraordinary fashion. Drop Owen an email to share your comments and opinions. Aroma: Slight, pleasant vinegar aroma. Big fruit, malt, raisins, cinnamon, clove, spice, vanilla, oak, cherry -- really complex. Appearance: Deep red to reddish-brown -- attractive. Flavor: Malty, sour/acid character, good, complex and bold flavors, aged well like a wine. This beer is perfect for style. Aroma: Intense horsey/earthy aromas are pleasant and right for style. Wheat, earth, sour, farmy, goat cheese, powerful. Appearance: Good white head with clover, honey color. Brilliant and clear. Flavor: Sour green apple, hint of vanilla, wood, good sourness, dry, wheat hints, well balanced. The acid here is not too astringent. Complex, clover, vinegar characters with nice aftertaste -- well made example of the style! Aroma: Tart, complex, goat cheese. Aroma is more subdued than the Gueuze listed above? Horse blanket (nice) -- soft aromas -- very well balanced. Appearance: Bright golden with a touch of haze. Beautiful and lightly carbonated.. Flavor: Tart, acid, dry, sherry/champage like, low carbonation, citrusy, balance is good, well aged, sophisticated, complex -- a phenomenal beer, but not for the faint of heart (Lambic unexperienced). Aroma: Complex grape, wood, orchard, leaves, earth, perfume, fruit, flowers. Appearance: Slightly cloudy, golden, very little carbonation/head. Flavor: Sour, citrus, wood, oak, vanilla, earth/cellar, spices, kiwi, fruit, complex/astounding flavors, green fruit. Very pleasant. Aroma: Sour, fruit, horse blanket, pepper, flowers, cherry, cherry pits, almonds. Appearance: Bright red, dark pink hints. Flavor: Cherry, lactic acid, wood, stones of cherry, sour, vanilla, horse blanket -- very complex and pleasant. This beer has a deep soul along with the rich flavors -- a work of art. Aroma: Orange, coriander, honey, spice, flowers, cinnamon, honeysuckle. Appearance: Golden with a hint of haze. Nice head. Flavor: Soft body, fruit, honey, lemon meringue, hint of soapy character, complex, lots of coriander and orange peel. Very drinkable. Aroma: Brown sugar, molasses, wood, hints of mint and paper. Flavor: Toasted nut hints, raisins, pumpkin seeds, slightly sweet, medium body, nutmeg/spices. This is a bit thin in body and flavor for style, but very pleasant and drinkable. Aroma: Light aromas of sapwood, yeast, spice. Appearance: Clear, beautiful, golden/copper color like apple juice. Flavor: Butter, malt, phenols, sherry, spice, alcohol, slightly sweet. This beer is flavorful, but perhaps lacks depth and complexity. It is warming and coats the tongue. Aroma: Bananas Foster dessert, butter, caramel, vanilla, cooked sugar.. Appearance: Head is color of foam on top of a latte coffee. Nice foam lacework on side of glass. Color is dark ruby/copper. Flavor: Banana phenols, burnt sugar, bready, slightly astringent, molasses aftertaste. This bottle could be a bit too oxidized. Appearance: Black with ruby highlights. Nice head. Flavor: Pleasant, but does not taste like it was made with ancient, wild yeasts (unfortunately). Stout and cinnamon like with a sweet/smooth character. Hints of black patent malt. Mild, pleasant, drinkable. To be more accurate, this beer should probably have more phenols and horse blanket character imparted from the wild yeasts of Belgium. Aroma: Acid, caramel, butter, spice, pepper, sugar, phenols, banana, raisin. Great complexity. Appearance: Dark with deep red hints. Clear and brilliant with a big head and creamy carbonation. Flavor: Medium/full mouthfeel, creamy, warming with hints of dark candi sugar, rum, malty sweetness, yeast, pepper, spices, phenols, and banana. This beer is yeasty and earthy with great complexity of plums and raisins, molasses, syrup, and alcohol. Aroma: Fruit syrup, raspberries, candy. Appearance: White foam with a medium/deep red color. Beautiful appearance. Flavor: Sugar, fruit candy, artificial, not complex, not authentic. This tastes like sweet fruit juice or jello. This beer is like soda pop -- no character -- all sugar.